This Olympia Karaoke Host has provided entertainment locally at parties, weddings, lounges, high schools, and various functions. He is required to set up and operate the karaoke equipment, and encourage audience members to participate and perform. He is also responsible for training and supervising a staff of trained professional karaoke hosts. This Olympia Karaoke Host is actively involved in maintaining and updating his song list and his equipment. He is currently operating with five systems, providing the community with quality Live Entertainment, Karaoke, and D.J. services. He also offers party rentals, which can be ordered with all the extras including: Pro Audio, Multiple Laser Disks, cdg's, and audio cd's, complete with party lights and speaker stands. 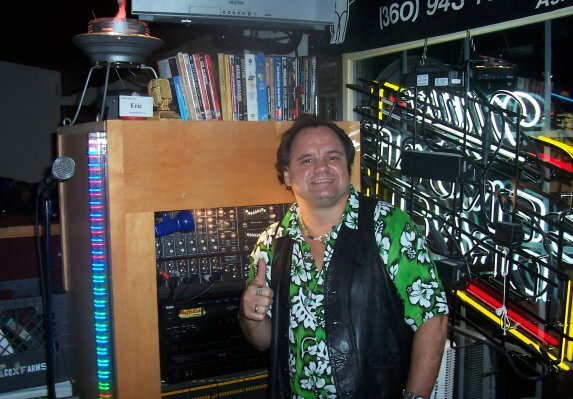 This Olympia Karaoke Host welcomes new accounts and enjoys meeting new business contacts that love music as much as he does. He literally has over 15 years of experience, and customer service is his middle name!